One thing I love about the art of storytelling, radio, and this platform is its ability to give voice to those who don't always have a voice. 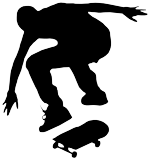 With that said, I'm a former skateboarder. I say former because once I was at this six stair rail at the old Amoco building in Chicago and I did this awesome trick where I broke both my ankles. So now I write and tell stories rather then hopping on a board. I want to still be able to walk when I turn 30. Skateboarding started in the West Coast. The rolling hills helped. During droughts skateboarders often skated empty swimming pools which eventually lead to the birth of the half pipe. Skateboarders out west quickly got organized...skate teams, competitions, parks, etc. In the Midwest we didn't have any of that. It's all flat land. We were continually getting kicked out of bank parking lots, school playgrounds, and the like. So being a skateboarder in Chicago meant we were continually looking for a place to exist. I'm working on a series of stories and poems about what it means to be a skateboader from the Midwest, and more specifically from the near west suburbs of Chicago in the late 90's. The attached recording is a story entitled "ADIOS" about me and a friend skating to the local Harley Davidson dealership to buy chain wallets and maybe biting off a little more then we can chew in regards to a generational and sub-cultural gap.